Turn Right onto Art Center Way and the Parking Garage will be immediately on Left. Take Exit 250 towards Sixteenth St/Fourteenth St/Tenth St.
Keep left to take the ramp toward 14th St/10th St. 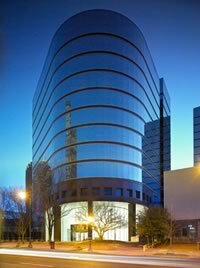 Turn left onto 14th St NW/US-19 N/GA-9 N.
Our office building is located one block north of the Arts Center MARTA station with the entrance between Arts Center Way and 17th Street on West Peachtree.